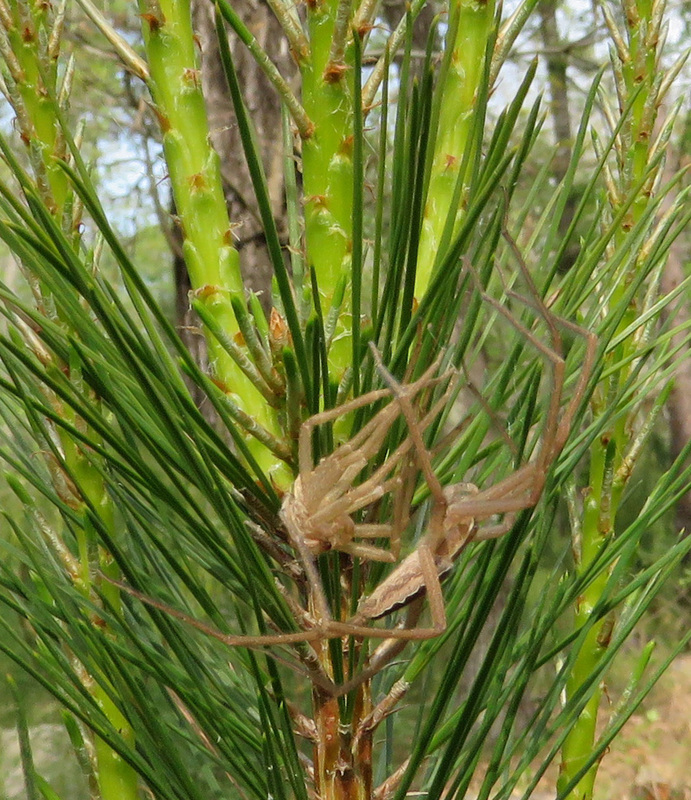 The other day, I was walking in the woods and noticed this spider in the top of a young pine tree. I couldn’t tell whether it had caught and eaten something, or it had just molted. Spider and … what? Previous skin? Dinner? 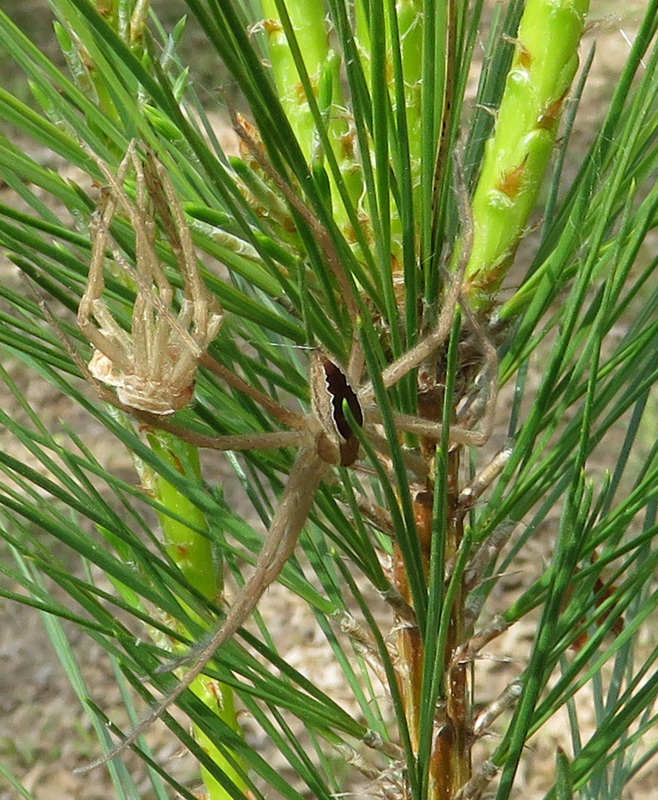 As I later found out, this is a Nursery Web Spider, Pisaurina mira. The spider slowly moved away from the skin. 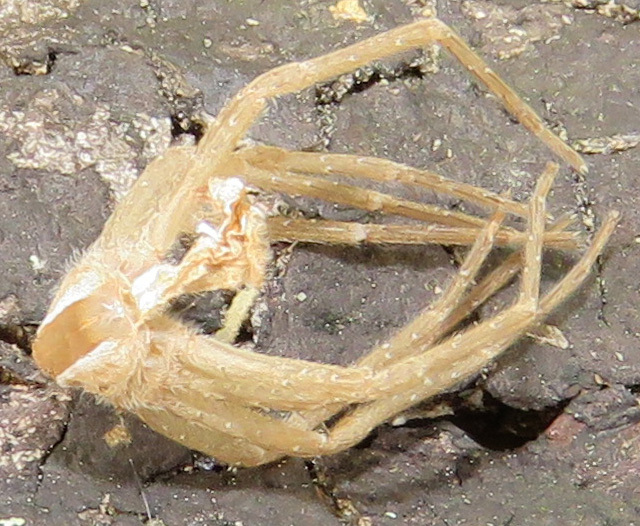 After a few minutes, I moved the empty shell to a better background, and it did look like a molted exoskeleton. Now I know very little about spiders, and my only spider identification book is a 1961 Dover reprint of a 1902 James Emerton book. It has small black and white illustrations, and in many cases, the spider’s name has changed in the last century, so I can’t always find new information. With this particular spider, I didn’t get any good pictures of its eye pattern or other anatomical details that would help me identify it, so I just went through the whole book looking at the pictures for one that seemed to match. I settled on Ocyale undata, but when I searched for that term, I didn’t find anything recent, just mentions in old books. It looked like the name had changed to Micrommata undata, and that led me to an illustration from 1835, at the American Museum of Natural History. The artist was Nicholas Marcellus Hentz, and there are 211 of his paintings in a collection there. (They are not available for use on a website, so you will just have to follow the link.) I love naturalists’ drawings; they seem so much more related to the actual creature than a photograph does. I loved the individual paintings of the spiders and wanted to know if this artist had recorded other animals as well; when I looked him up on Wikipedia, I found out that he is known as the first arachnologist in the United States. He had come to the US as a young man, when his family was exiled from France in 1816, for having supported the French Revolution. Hentz taught at many schools, but always seemed to have trouble getting along in the community, and always had to move and start new schools. Alright, so that is plenty of information about the arachnologist and his wife — let’s get back to this spider. 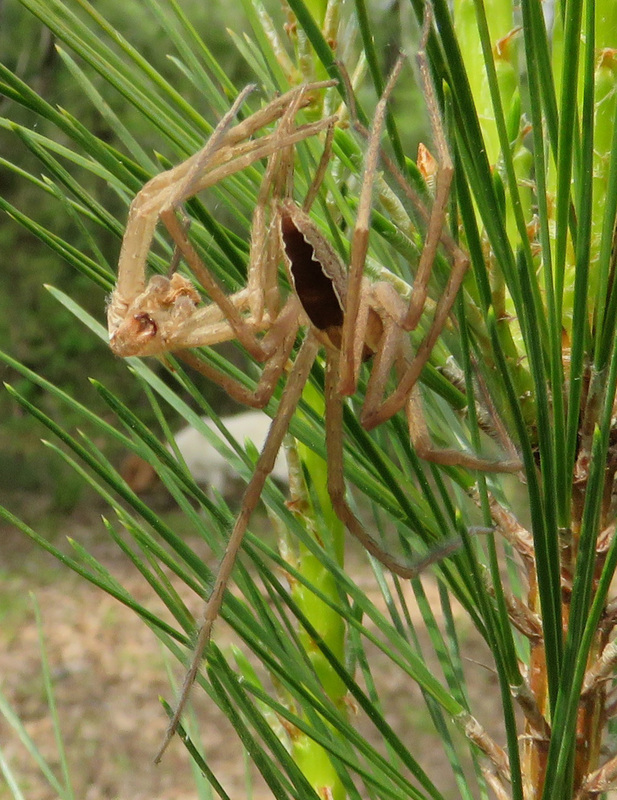 I went looking for the spider again today, to see if I could get better pictures, but it had moved on. Someday I will probably buy a more up-to-date spider identification guide, but today I enjoyed following sidetracks from an old book to even older ones! Great post, as is your post on spinning wheels in literature. Thanks! It just seemed like a huge coincidence to come across Caroline Lee Hentz’s writing by such different directions. Very interesting. I find some spiders from time to time n if I don’t recognize them, I go to Internet. It’s usually helpful since I don’t have a recent book. Hmm, need to visit a 2nd hand book store.